This exciting letter sounds game is great for preschool and kindergarten. Before learning to read, kids must first understand that each letter has an individual sound. This can be a very challenging skill because some letter sounds such as /b/ and /d/ are very similar. Mastery really requires lots of practice. There’s no better way to practice than with an exciting interactive activity. When playing games, my students always loved when they got to hold something. The responsibility of being in charge of a particular component really kept them engaged. This game allows kids to control two or more letters at a time and can be played with one or more kids. No matter the size of the group, the fun of this letter sounds game is the same. After printing, cut out the letter circles. You can stack the pages together to cut multiple pages at once. I know many people don’t like to do this, but it really is a time saver. You can choose from both capital and lower case letters. Once all of the letter sounds circles have been cut, you can simply tape them to the craft sticks. Or for added durability, laminate the cut circles prior to adhering to the craft sticks. This game can be played in a variety of ways, beginning with just 2 letter paddles. Once your child is holding two letters, you will start saying words aloud that start with one of those two letters. 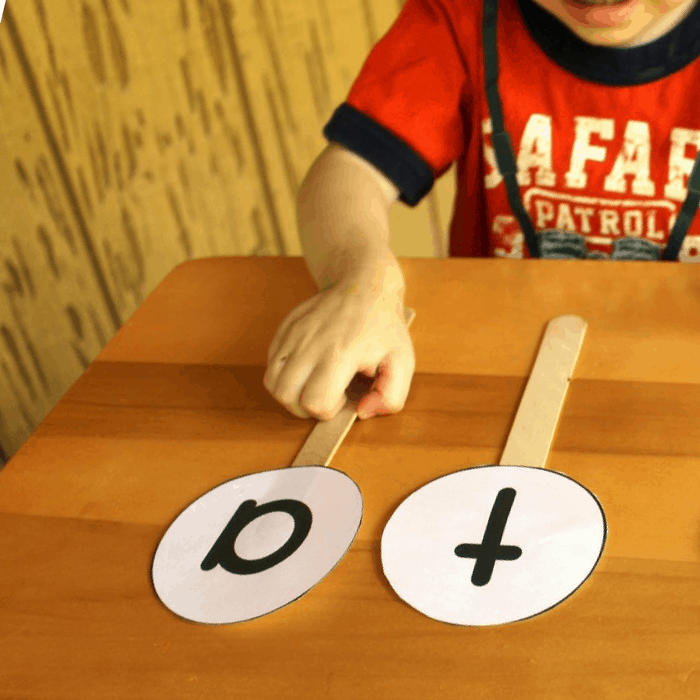 Each time you say a word, your child will hold up the stick with the corresponding letter. For example, if you say “apple” your child will hold up the letter a. When saying words for the corresponding letters, do NOT alternate every other word. If you do, your child will be able to anticipate the correct letter and will not really be thinking about his/her answer. Instead, be completely random. For example, sun, man, mighty, sad, salty, sandbox, moo etc. 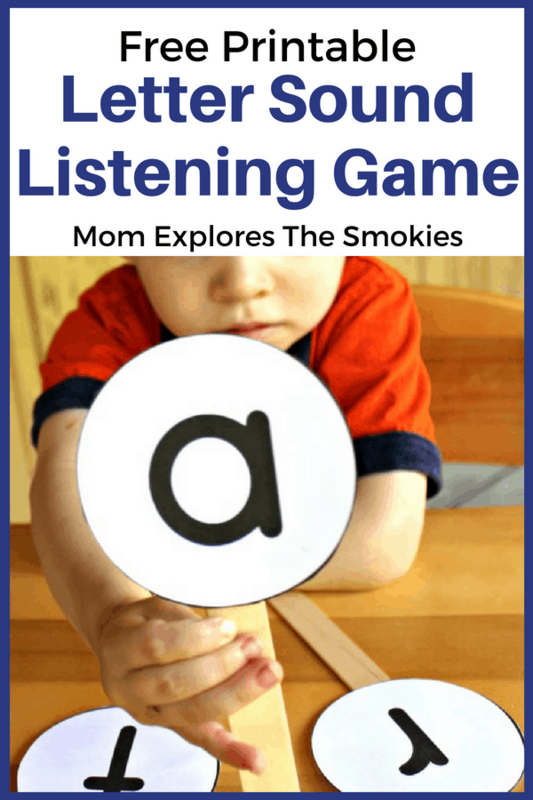 Being random will keep your child on their toes and ensure that they are truly making a connection between the letter and the sound. Once your kids have advanced past using two letters, you can set multiple paddles on a table and let them select from a larger field of letters. Once your child has mastered beginning sounds, you can use the same game to have them identify ending sounds, which is a harder skill. Or, they can identify medial sounds (sounds in the middle of the word), which is the hardest of all. Low Muscle Tone – You can bolster the craft sticks with a piece of foam to facilitate a tighter grip. Sensory Approach – You can enhance the letters with matching puffy paint colors, or matching pieces of felt that have been cut to shape. You can also glue on colored glitter or sand. Be sure to check out the rest of our wonderful kids activities! If you subscribe to our weekly newsletter, we will give you this download as a FREE thank you gift. The printable will be delivered directly to your email inbox after you sign up. If you’d rather not go the free route, you can also purchase this letter sounds printable from our store for .99 cents. Which ever option you choose, we thank you for supporting our small business! Join our newsletter and receive this printable as your thank you gift. At the email address provided, you will receive newsletters with our latest posts, featured products, & more! You can unsubscribe at any time. My son will love this fun activity. I also love the tip on how to keep your child on their toes! I signed up and never received this. I apologize. You should be receiving it shortly. I put it in my email twice for the freebie and I have not seen it in my inbox the last few days. I have also checked my SPAM folder.